I often let my kids choose all or part of our dinner menu, and when they choose, they also help cook. 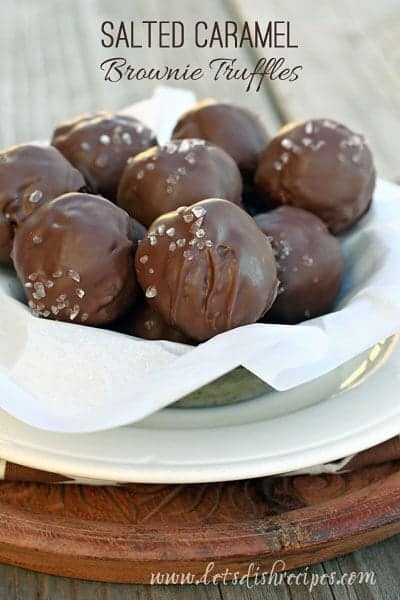 And these Salted Caramel Brownie Truffles are perfect for making with kids. I confess, I’m not always excited about their choices. They must have better taste than I do though, because I always end up loving everything they help me make. Don’t get me wrong, I knew these Salted Caramel Brownie Truffles would be good, but I didn’t think they’d be “I can’t stop eating them” good. I should have known–chewy chocolate brownies and Rolos, covered in chocolate and sprinkled with a dash of sea salt. Of course I couldn’t stop eating them! And they’re so easy to make. The recipe calls for a box mix, but you could certainly use your own recipe, as long as the brownies are chewy rather than cakey. Enjoy! Prepare brownies according to the 2 egg directions on the back of the box. Cool completely. Cut the brownies into 1 inch squares (you should have 34-36 pieces). Place an unwrapped Rolo on each square. Wrap the brownie around the Rolo and form into a ball. 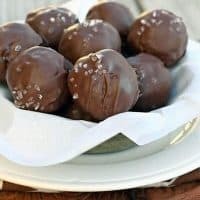 Place the brownie balls on a baking sheet lined with wax paper. Refrigerate for at least one hour. In a microwave safe bowl, microwave the chocolate at 50% power for one minute. Stir. Repeat at 30 second intervals until chocolate is completely melted. Dip the brownie bites into the melted chocolate. Sprinkle with a pinch of coarse sea salt. Place on wax paper until chocolate is set. Who Dished It Up First: Adapted from Inside BruCrew Life. two of my favorites – salted caramel & brownies! Looks delicious!! Yes please, I’ll take 4! Your kids are talented, I don’t I would have came up with these when I was young! These look to-die-for! These look amazing….and so far pretty easy to make! I am making them for my daughter’s teacher gifts! One last question as I get to the last step, I have dipped the brownie truffles into the choc & sprinkled my sea salt. In order to “set” the chocolate, do I have to put them back in the refrigerator (like I did after I balled them up)? I usually do because I’m impatient. 🙂 But it’s not required, unless your chocolate doesn’t seem to be setting well. I made enough to share–no really–I didn’t eat them all. Everyone raved about them. Next time I am making them with homemade brownies and they will be even better. I think I’d make a double batch of brownies and only use the inside pieces. The crusty ends were a little too hard to form around the Rolo. My Brownie mix doesn’t have a 2 egg option. It only gives directions for making with water, veg oil and 1 egg. What do I do? Just make it with one egg. Wondering how long stay fresh after making ? Also is it best to store in the fridge ? They should stay fresh for at least a few days, probably more. I would not refrigerate them. The caramels inside would become hard to chew. If you do, I would bring them to room temp before eating.